Despite Matt Ryan’s MVP-caliber year thus far, with the game on the line, there is nobody better than Tom Brady. He is second all-time in fourth quarter comebacks with 38 and is third in QB Rating in the fourth quarter at 113.1, barely a point behind Aaron Rodgers in first. This year, Brady posted an 89.0 two-minute drill QBR, which is third best in the league. It’s not just that he did this in a shortened 12 game season thanks to Roger Goodell (Pats fans will not let him forget), and it’s not because the Patriots were the most dominant team this year in the AFC (see 36-17 over Pittsburgh Steelers in AFC Championship game). Tom Brady has simply been here before. In his seventh Super Bowl appearance, Brady will cement himself into Super Bowl history by adding to his already Hall of Fame worthy résumé in the biggest game in America. He holds the record for every major passing category in the Super Bowl and, with a win, could tie Charles Haley, a Hall of Fame defensive end, for most Super Bowl wins at any position. Tom Brady has defied common thought—he is 39 years old and is throwing like he’s in his prime. He hasn’t slowed down either, throwing for 384 yards against the Steelers. In addition, he makes others around him better as Chris Hogan had the game of his career against the Steelers with 9 receptions, 180 yards and two touchdowns. LaGarrette Blount led the league with 18 rushing touchdowns, and with Brady and Edelman excelling in the passing game, Blount does his job well: get hard yards, take time off the clock, and make defenses respect the run game. But the importance of Brady in the fourth quarter says something: the Atlanta Falcons are going to make this a close game. Matt Ryan and his electric offense are a force to be reckoned with. In his two playoff games thus far, Ryan dominated Seattle and Green Bay, throwing for 730 yards and seven touchdowns. Julio Jones’ athleticism and above average hands make him a viable threat to the Pats secondary. Devonta Freeman is a dependable back, but has only broken 100-yards rushing twice this season, including only rushing for 45 yards in both playoff games. That means the Falcons, much like the Patriots, will be throwing the ball plenty. The Patriots defense allowed an NFL-low 15.4 points per game, but statistics are deceiving. The best quarterbacks they faced this year were Russell Wilson, Joe Flacco, and Ben Rothlisberger. The Pats gave up 31 points in a loss to Seattle, while Flacco came up a touchdown short. Rothlisberger was hopeless without Leveon Bell, the best running back in the league, and Antonio Brown was double-teamed most of the night. There is hope for the Falcons here if Julio Jones can outplay New England’s Malcolm Butler, the elite cornerback covering Jones, and if Matt Ryan can find him. It’s no secret that the Patriots are expected to win this game, in part due to Atlanta’s weak defense. The Falcons gave up 371.2 yards and 25 points per game this season. They somehow managed to stifle Aaron Rodgers and Green Bay, but the Packers were shorthanded from injuries and limped into the NFC Championship game with a no name defense. The Patriots run defense is solid, only allowing three runs of 20-plus yards and six rushing touchdowns, both league lows. With Malcolm Butler covering Julio Jones, it is all on Matt Ryan to prove he is the MVP by carrying the Falcons. 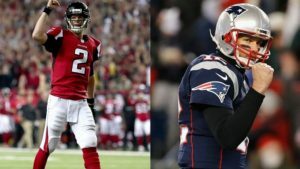 It is going to be a shootout for Atlanta, and that’s exactly the kind of game Tom Brady excels in. The Belichick-Brady duo was built for excellence, and experience is everything on the biggest stage in America. And after all, Tom Brady has been here before. Junior Jack Keffer is a contributing writer. His email is jkeffer@fandm.edu.